What sound does an airplane make? Whooosh!!! 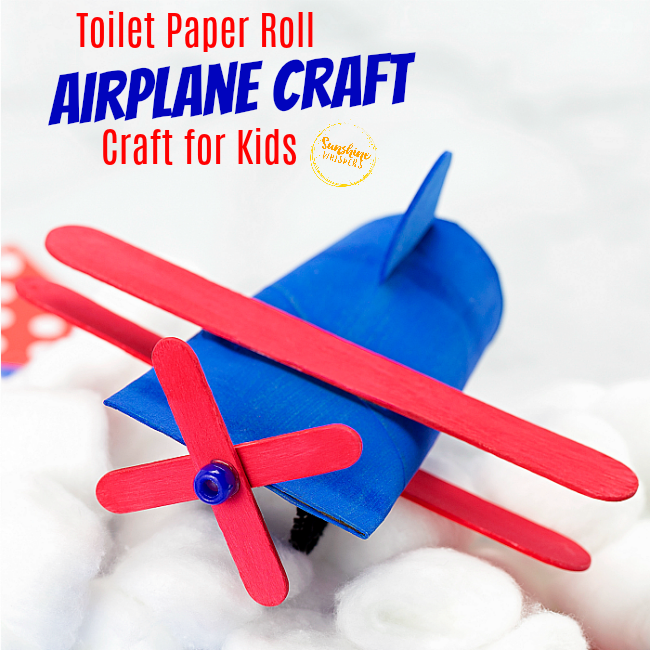 Our daughter loves airplanes and she really loved helping me makes these toilet paper roll airplane crafts for kids. Her Daddy is really into airplanes so it is good that she likes them. I am not sure she has a choice. Ha! I am totally fine with that though because it definitely brings balance to princesses and all the girlie stuff that makes her our Sweet Pea. 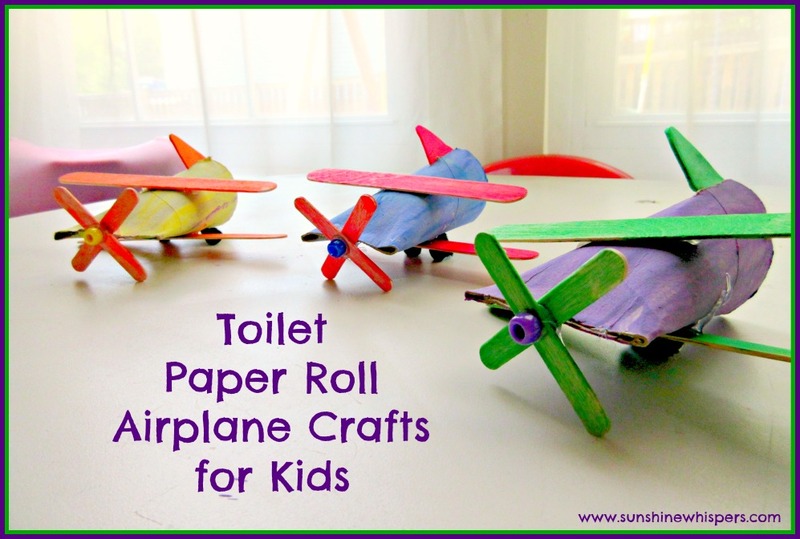 Anyway, aren’t these toilet paper roll airplanes the cutest? 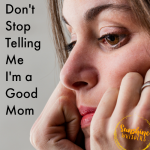 Read on to find out how we did (and truth be told.. didn’t) make them! tempura paint. We used two different colors of paint for each airplane. 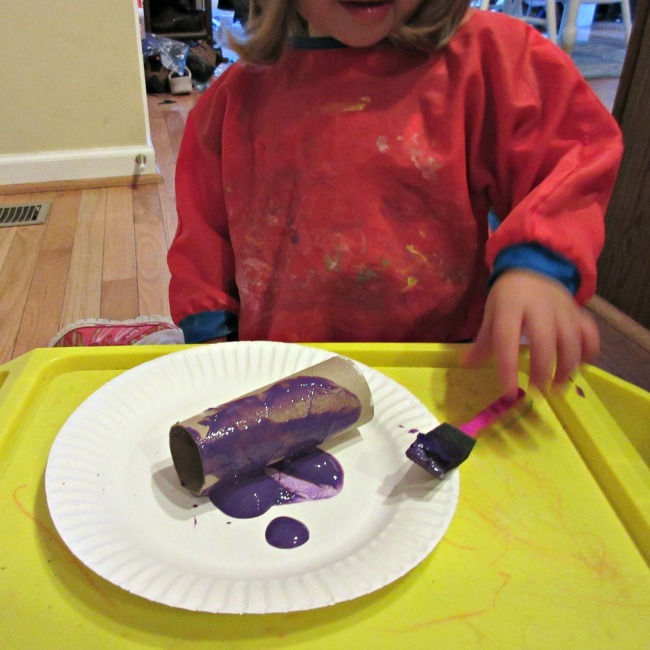 For the three airplanes we made, we used purple, green, blue, red, yellow, and orange paint. optional: Dot paint markers. I say optional because you really can just use regular tempura paint for both parts of the airplane. However, we have them so I thought Sweet Pea would enjoy using different techniques to paint each part of the airplane. paint brushes and something to hold the paint. 1 pony bead to match the color of the airplane fuselage (my husband would be so proud. I said fuselage). 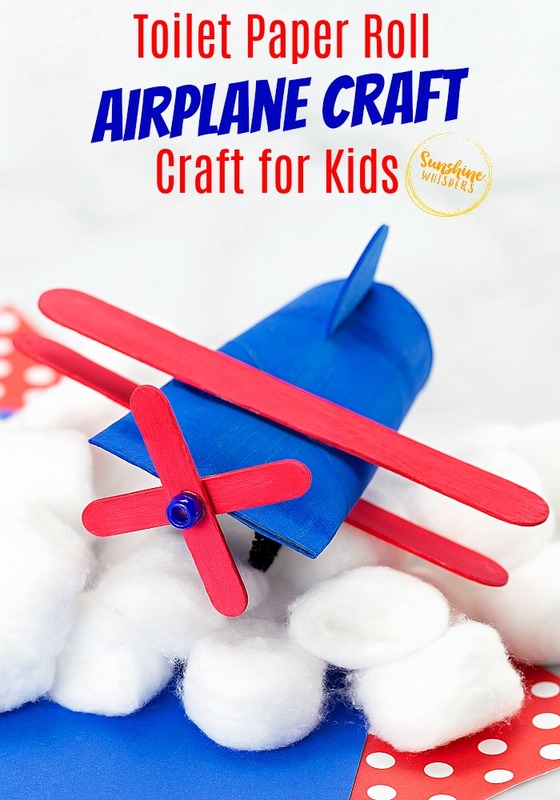 Here is another version of this super cute airplane craft! 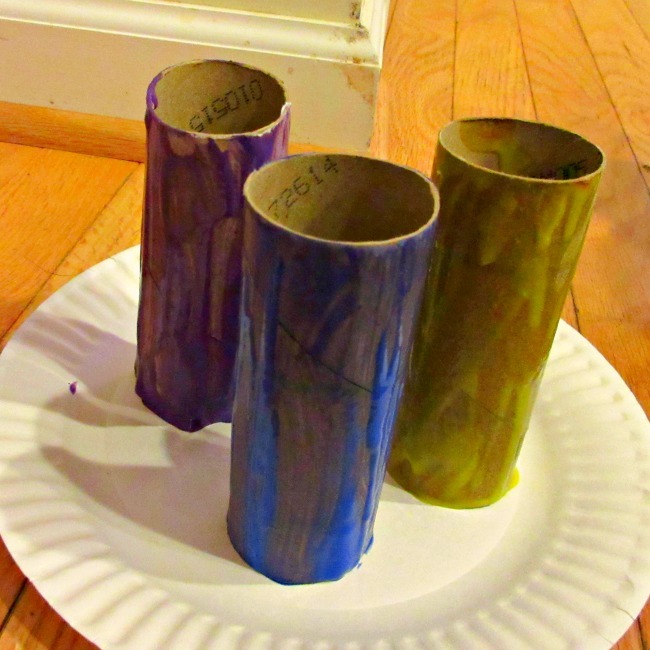 Paint each of the toilet paper rolls. Sweet Pea picked out the colors– purple, blue, and yellow. 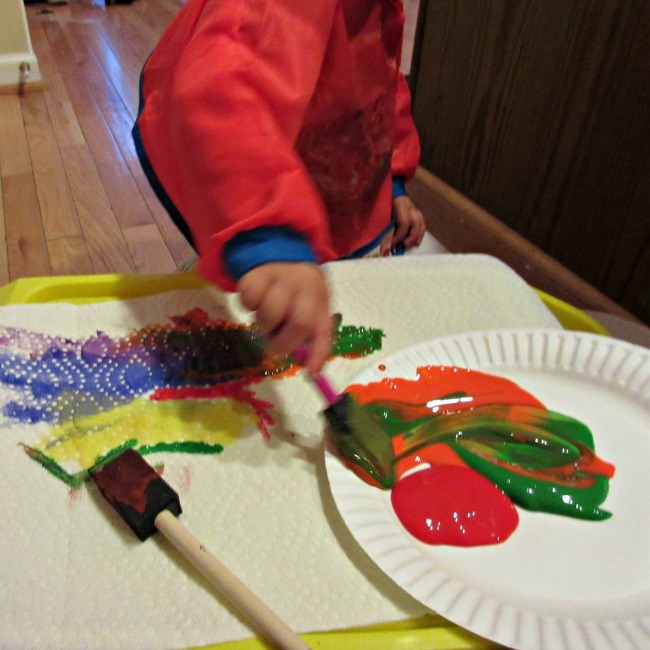 I placed the toilet paper roll on a paper plate in order to contain the paint mess. You will need to use at least 2 to 3 coats of paint per airplane in order to make the colors pop. For the yellow airplane we used about 5 coats of paint. Let dry standing up on a paper plate. Paint each set of wings and propeller craft sticks. Altogether, you will have 4 craft sticks per airplane (2 large and 2 mini craft sticks). It might be helpful to paint all four of the same color craft sticks before moving on to the next set of wings and propellers. We used the dot paint markers for this step. However, it is almost just as easy to use tempura paint. So, I have a little bit of a disclaimer. Sweet Pea loved painting the airplanes.. for about 5 minutes. Then she was restless and wanted to do something else. I imagine this is partly because we started this craft after dinner and a long day of playing and learning. However, I did manage to somewhat rescue the activity by letting her paint paper towels. Who knew? Ha! As with many toddler crafts I do with Sweet Pea, she participates in part of the craft, but not the entire thing. Mostly, I involve her in the process oriented aspects of the craft and then finish off the details by myself. Many times those details involve hot glue, so it is a safety issue. 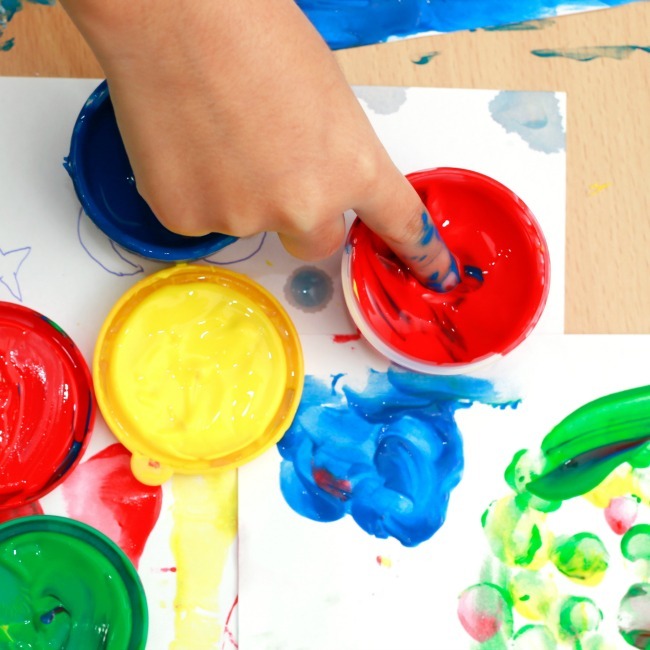 However, sometimes, her little 2-year old fingers and brain cannot grasp what we are really trying to create. I imagine that over the next year, her ability will grow significantly. The only reason I point this out is that this tutorial is my experience with my 2-year old. 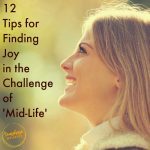 You may need to adjust based on the age and abilities of your own kiddo. I started by hot gluing the airplane nose together. 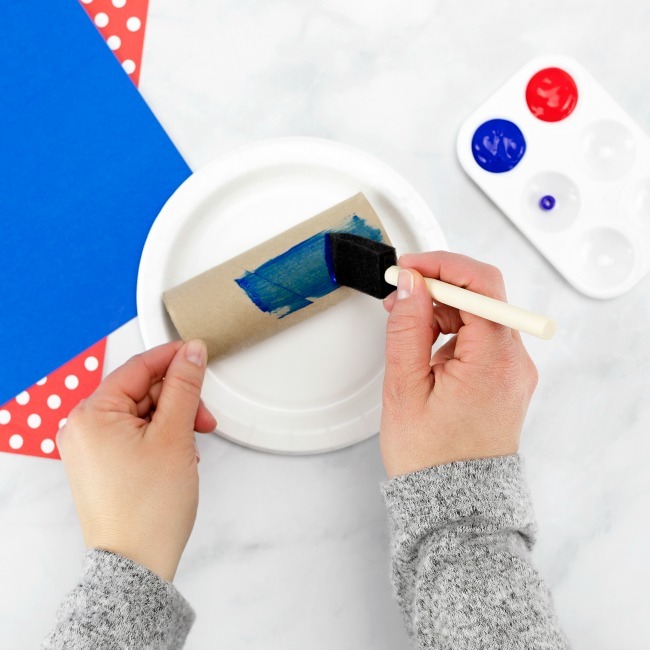 Basically, apply a thin strip of hot glue to one inside lip of the toilet paper roll and press the top and bottom of the toilet paper roll together until the glue sets. This should take less than 10 seconds. 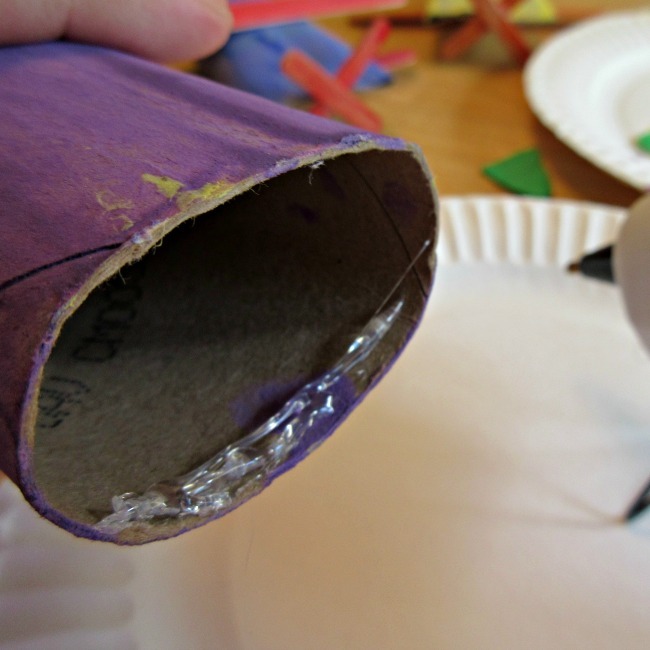 For the wings, apply a thin line of hot glue across the middle-top of the toilet paper roll and then press one of the large craft stick into the glue. Turn the toilet paper roll over and do the same thing to the middle-bottom of the toilet paper roll. Try to line up the craft sticks so that the wings are lined up. 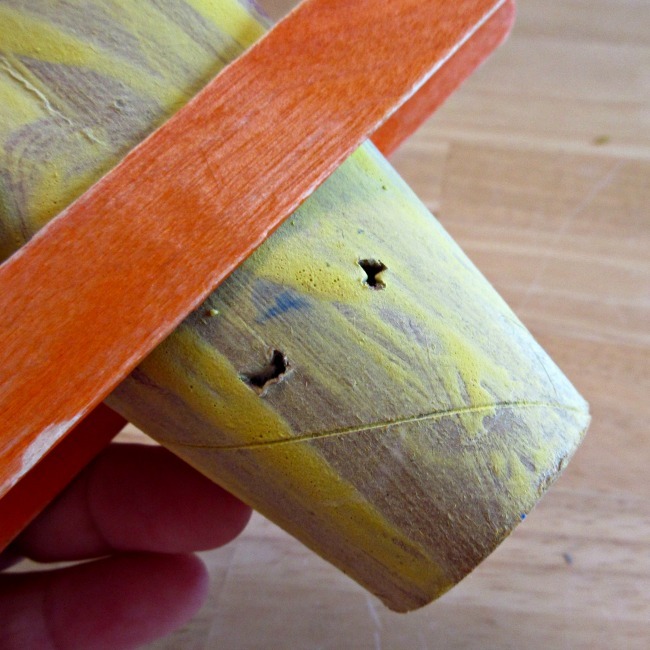 For the propeller, apply one dot of hot glue to the center of one of the mini craft sticks. 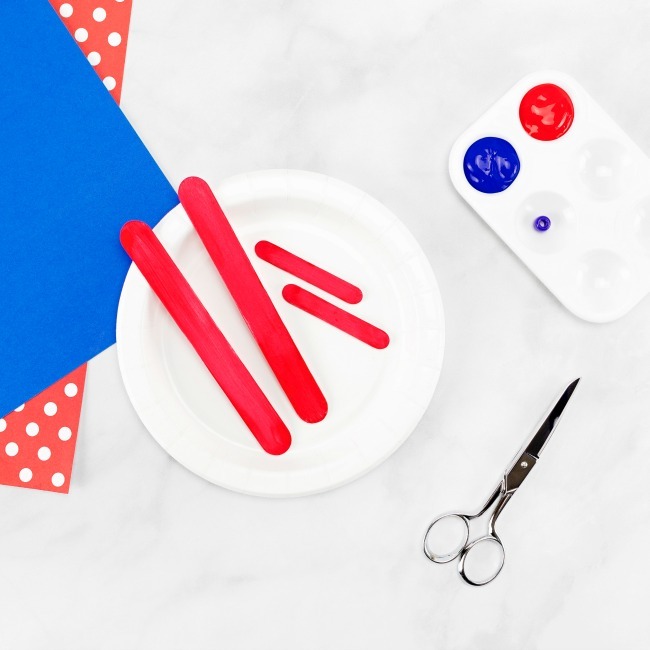 Press the second mini craft stick into the glue to form an ‘X’ with the two mini craft sticks. At the nose end of the toilet paper roll (the one you pressed together with hot glue), apply a large dot of hot glue to the center of the nose. Press the propeller into the hot glue and hold it until the glue sets (about 10 seconds). To make the fin (now I am losing all credibility because I am fairly certain this piece is not really called the fin. 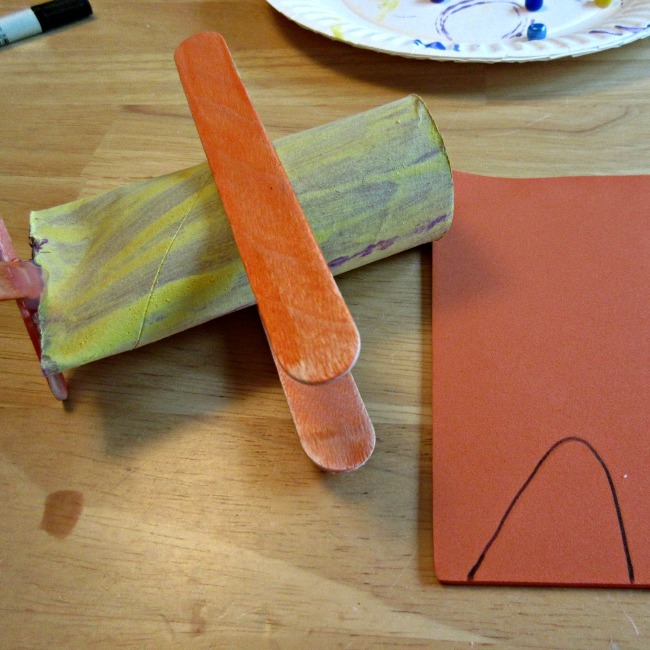 ‘sigh.’), draw the fin shape onto the craft foam sheet that matches the color of your wings and propeller. Cut it out. 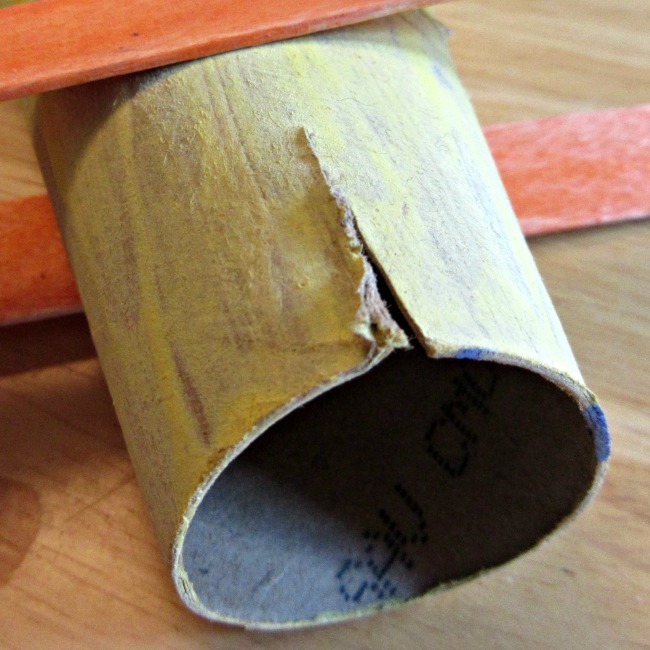 Use the exacto knife/razor to cut a 2-3″ notch into the top of the back end of the toilet paper roll (airplane). You may have to follow up with scissors to make the slit wide enough for the foam fin. Wiggle the foam fin into place, with the vertical end in the back and the sloped end facing toward the front of the airplane. You may have to fiddle with the size of the slit, or trim the fin until it fits correctly. Ultimately, you want the back of the fin to be aligned with the back of the toilet paper roll. For the landing gear, turn the airplane over and use the razor to poke two holes into the toilet paper roll, just behind where you glued the wing. 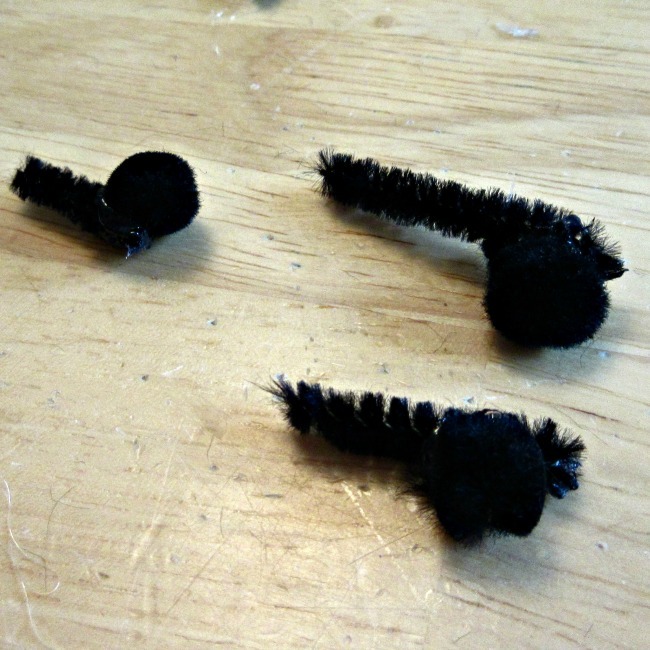 Cut two small (2-3″) pieces of black pipe cleaner per airplane. Bend the end of each piece to form a little ‘J’. In the bend of each pipe cleaner piece, apply a dot of hot glue and carefully (I burned my fingers more than once) press on mini black pompom per pipe cleaner piece into the glue. Poke the other end of the landing gear piece into one of the holes you made and adjust so both wheels are at the same length. The last step is to apply a dot of hot glue to the center of the propeller and then press the pony bead (the color should match the color you painted the fuselage) into the glue until it sets. There you have it! 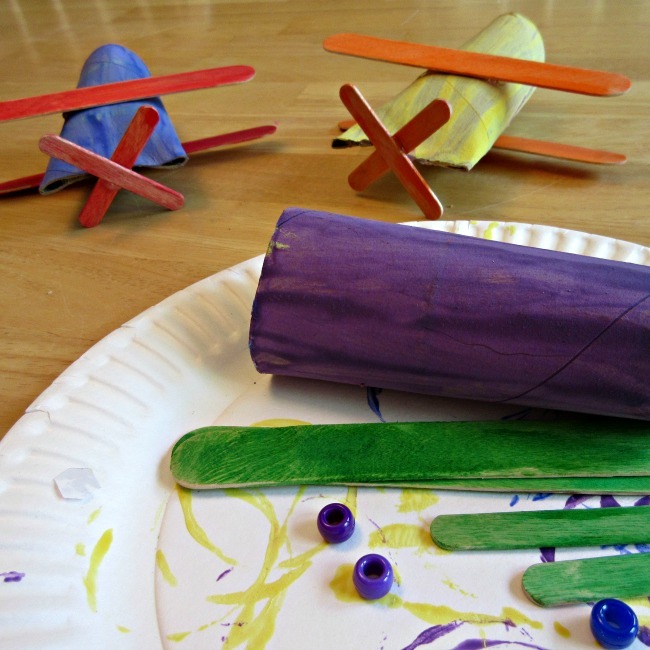 In no time flat you can create an airplane fleet for and with your kids! Sweet Pea was pretty excited to wake up from her nap to these cute little airplanes. Part One of this craft probably took 30 minutes from set up to clean up. Part Two took probably 20 minutes from set up to clean up. 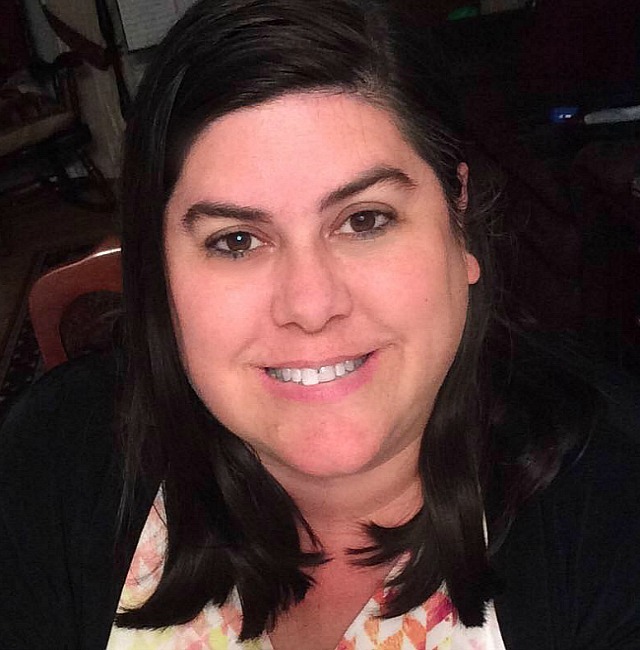 Thanks again for reading and happy flying!